Australia Reaches $53 Million Settlement With Refugee Detainees : The Two-Way It's one of the largest human rights class-action settlements in Australian history. The Manus Island camp, an all-male facility, has for years been blasted by rights groups for its conditions. Facilities at the Manus Island Regional Processing Facility in 2012, used for the detention of asylum seekers who entered Australian waters. The Australian government has agreed to a $53 million settlement with 1,905 people who were held at a refugee detention camp on Manus Island, Papua New Guinea. It's one of the largest human rights class-action settlements in Australian history. The Manus Island camp, an all-male facility, has for years been blasted by rights groups for its conditions. The detainees party to the lawsuit were held there at various times between November 2012 and May 2016, and say they suffered from negligence and false imprisonment. Asylum-seekers trying to reach Australia by boat were routinely intercepted by Australian authorities and taken to facilities on Manus or on the island of Nauru. "Officials say they will never be allowed to settle in the country. That's true even if authorities determine them to be refugees who would qualify for asylum," NPR's Camila Domonoske has reported. Instead, they were held indefinitely at the detention centers. "Eyewitnesses have reported appalling conditions at some of the detention facilities, with violence, abuse and pervasive psychological trauma." 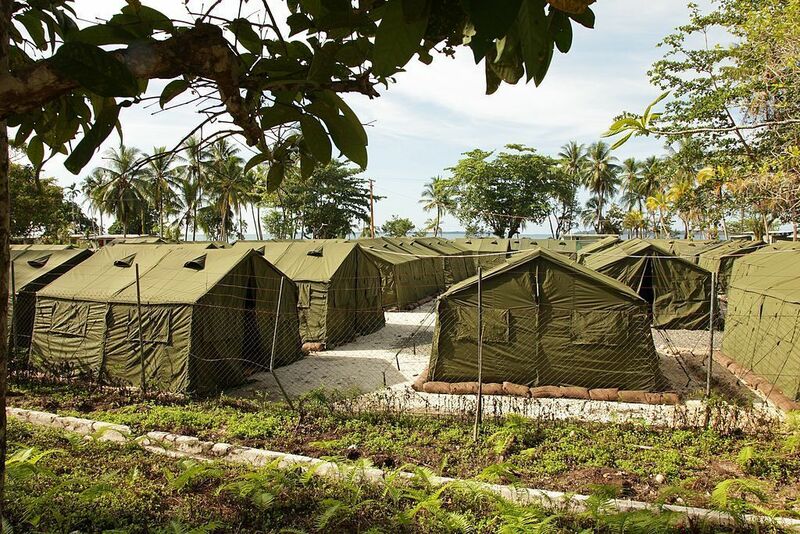 The governments of Papua New Guinea and Australia announced last August that they plan to shut down the Manus Island camp, after the Papua New Guinea Supreme Court found the detention of the refugees "unconstitutional and illegal." The facility is now scheduled to be closed in October, according to The Guardian. Some beneficiaries of the class-action lawsuit are likely heading to the U.S. The Obama administration agreed to take 1,250 refugees from Manus and other offshore facilities. The Trump administration has agreed to uphold the agreement, though President Trump has called it a "dumb deal." "While no amount of money could fully recognize the terrible conditions the detainees endured, we hope today's settlement can begin to provide them with an opportunity to help put this dark chapter of their lives behind them," plantiffs' attorney Andrew Baker said in a statement. Lead plaintiff Majid Kamasaee fled Iran in 2013 because of religious persecution. "I was severely burned in a fire when I was a child, and needed more than 30 operations, including skin grafts," he said in a statement read by his attorney. "When I arrived on Manus they confiscated my medicine. Every day in the harsh sun my skin felt like it was on fire. " He was eventually transferred to Melbourne, Australia, for medical treatment, according to court documents. The settlement deal still needs court approval. Private contractors G4S and Broadspectrum, which were involved in running the camp, are also named as defendants, and it's not clear how much each will pay under the agreement. It's worth noting that Australia's government does not view the settlement as an admission of liability. Minister for Immigration and Border Protection Peter Dutton said in a statement that the "Commonwealth strongly refutes and denies the claims made in these proceedings." Dutton said that settling the matter was a "prudent outcome for Australian taxpayers," rather than wade into a months-long legal battle that could cost tens of millions of dollars in legal fees. Even though the case did not go to trial, the plaintiffs' lawyers say it involved more than 50 court appearances, more than 200 witness interviews and more than 200,000 documents. The defendants are also liable for about $15 million in legal fees, in addition to the $53 million in the settlement. It's not clear exactly how the money will be distributed between the people who were detained; according to Reuters, lawyers said that "the compensation would be distributed among the former and current detainees according to the length of their detention and the severity of the injuries and illnesses they alleged they had suffered." According to The Guardian, about 900 men remain at the Manus Island facility.